Elisabeth Werner, a member of the mathematics faculty since 1989, has discovered new applications for convex geometry. Photo by Mike Sands. Most of us are familiar with three-dimensional convex shapes—a category that includes spheres of all kinds, from baseballs to planets, and rearview mirrors that make objects appear farther away than they actually are. Case Western Reserve mathematician Elisabeth Werner thinks a lot about convex shapes, but not just in the usual three dimensions. She analyzes them in any number of dimensions—two, four, 157, you name it. Visualizing a four-dimensional shape, let alone a 157-dimensional one, can be mind-boggling, Werner admits, but the effort can yield rich insights that don’t emerge from analyses in fewer dimensions. Those efforts, as well as many others, recently earned Werner a 2014–15 Faculty Distinguished Research Award. She is one of five CWRU faculty members receiving the award this year. Werner’s work has greatly advanced convex geometry, says David Singer, professor and interim chair of the Department of Mathematics, Applied Mathematics and Statistics. One of Werner’s best-known results involves a branch of the field known as approximation theory, which mathematicians use to analyze complicated, many-dimensional shapes, often with help from computers. Werner discovered that approximating a convex shape’s volume by creating a simpler shape from randomly chosen points can work as well as methods requiring far greater computing resources. “This tells you there is something like a free lunch, which normally doesn’t happen,” Werner says. More recently, Werner has established connections between convex geometry and information theory, a discipline that has helped computing become a major technology and driver of economic growth. In collaboration with Kerr Professor of Mathematics Stanislaw Szarek, she has also linked convex geometry with quantum information theory, which pushes computing and information theory into the tiny and strange realm of quantum mechanics. Convex geometry, Werner has found, provides a way to analyze the capacity of a quantum information channel. A CWRU faculty member since 1989, Werner has had continuous research funding for 25 years, including a 22-year (and counting) string of individual grants from the National Science Foundation (NSF). Together with Szarek, she has also received a $1.4 million NSF Focused Research Group grant, in which CWRU led a collaboration with Kent State, the University of Michigan and the University of Missouri. In another form of recognition, Werner was named an inaugural fellow of the American Mathematical Society in 2012. When her Faculty Distinguished Research Award was announced in April, Werner was on leave at the Institute for Mathematics and its Applications (IMA) at the University of Minnesota. Normally, President Barbara R. Snyder, Provost W. A. “Bud” Baeslack III and Vice President for Research Suzanne Rivera would have made a surprise visit to her classroom to share the news. But a trip to Minneapolis seemed impractical, so they called Werner instead. They also sent advance word to her IMA colleagues, who started dropping by her office, hoping to see her reaction. “People would pop into my office with all kinds of strange requests,” Werner recalls of that afternoon. But once she got the call, she understood what was going on. 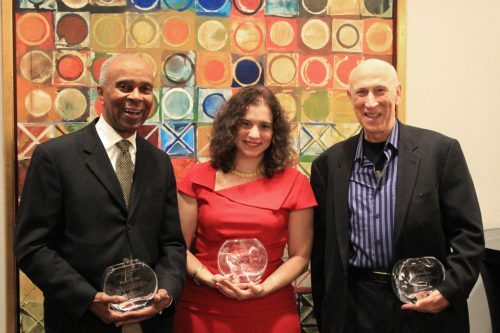 During Homecoming Weekend this fall, three winners of 2015 Alumni Awards from the College of Arts and Sciences were on hand to receive their honor. Harold D. McRae (left) and Malcolm H. Gissen (right), both members of the Adelbert College Class of 1965, were named Distinguished Alumni of the Year. Santina Protopapa (CWR ’00) was named Young Alumna of the Year. The Distinguished Service Alumnae of the Year were Tracy Epp (CWR ’97) and Elizabeth Hill (CWR ’97, GRS ’97). To submit nominations for the 2016 Alumni Awards, please visit artsci.cwru.edu/development/alumni-awards. The deadline is Dec. 31, 2015. The awards will be presented during Reunion and Homecoming Weekend, Oct. 13-16, 2016. Rebecca Benard, instructor in the Department of Biology, received the Carl F. Wittke Award for Excellence in Undergraduate Teaching. Gillian Weiss, associate professor in the Department of History, received the J. Bruce Jackson, MD, Award for Excellence in Undergraduate Mentoring. Elina Gertsman, associate professor in the Department of Art History and Art, received the John S. Diekhoff Award for Graduate Teaching. Karen Potter (GRS ’89), professor and chair of the Department of Dance, received the John S. Diekhoff Award for Graduate Mentoring. Henry Adams, the Ruth Coulter Heede Professor of Art History, is the author of Thomas Hart Benton: Discoveries and Interpretations. Timothy Beal, the Florence Harkness Professor of Religion and chair of the Department of Religious Studies, was one of 36 authors to receive a 2015 Public Scholar Award from the National Endowment for the Humanities. The awards program promotes the publication of scholarly books conceived and written for general audiences. Beal is at work on a cultural history of the New Testament Book of Revelation. Erin E. Benay, assistant professor in the Department of Art History and Art, is the co-author, with Lisa M. Rafanelli, of Faith, Gender and the Senses in Italian Renaissance and Baroque Art: Interpreting the Noli me tangere and Doubting Thomas. Robert W. Brown, Distinguished University Professor and Institute Professor in the Department of Physics, has published “Challenges in Faculty Entrepreneurship in the Sciences: Becoming an Entrepreneur but Staying at the University,” a chapter in the book Embracing Entrepreneurship Across Disciplines: Ideas and Insights from Engineering, Science, Medicine and Arts, edited by Satish Nambisan. Michael W. Clune, professor in the Department of English, is the author of Gamelife: A Memoir, which was excerpted in the September issue of Harper’s Magazine. Alan J. Rocke, Distinguished University Professor and the Henry Eldridge Bourne Professor of History, was one of two chief historical advisors for the PBS series The Mystery of Matter: Search for the Elements. Peter A. Shulman, assistant professor in the Department of History, is the author of Coal & Empire: The Birth of Energy Security in Industrial America. Two master’s students in the Department of Art History and Art obtained highly competitive graduate internships this year. Mason McClew spent the summer at the National Gallery of Art in Washington, D.C., while Molly Phelps interned at two Boston institutions: the Museum of Fine Arts and the Isabella Stewart Gardner Museum. Erin Milne (GRS ’09) has been named director of assessment and planning in the Office of Academic Affairs at Massachusetts College of Liberal Arts. Carolyn G. Truesdell (FSM ’61) has been elected chair of the board of managers for the public health care system in Harris County, Texas. William R. Heath (GRS ’66, ’71) is the author of William Wells and the Struggle for the Old Northwest. John Thomas (ADL ‘67), founder of !Problem Solving International, has published an ebook titled The Winning Weekend Warrior. Dorothy Anne Essman Richmond (GRS ’70), professor and vice chair of pediatrics at Georgetown University Hospital, has received the 2015 “Wall of Achievement” alumni award from the Wellston School District in Ohio, where she earned her high school diploma. Sheila Greenbaum (FSM ’71) was selected for the 2014 Missouri Bar Pro Bono Wall of Fame. Greenbaum chairs the appellate law practice group at Capes, Sokol, Goodman & Sarachan in St. Louis. Paul E. Kerson (ADL ’72, GRS ’72) was elected president of the Queens County Bar Association in Queens, New York. Frank Calcagno, Jr. (WRC ’77, GRS ’79), a senior security adviser and engineering geologist based in Fairfax, Va., has been named to the security and safety services team of Gannett Fleming, Inc.
Thomas Li-Ping Tang (GRS ’77, ‘81, psychology) has been elected as a distinguished alumnus by the faculty of the Department of Psychology at Chung Yuan Christian University in Taiwan. Tang is a professor of management at Middle Tennessee State University. Susan Lucas (FSM ’77, GRS ’78) has been named executive director of the Coastal Women’s Shelter in New Bern, N.C.
Cadmus Collins Rich (WRC ’87) has been appointed vice president for medical affairs and clinical development at Inotek Pharmaceuticals Corp. in Lexington, Mass. Michael Finley (CWR ’93) was promoted to senior scientist at Merck in January 2015. A member of the corporation’s Screening & Protein Sciences group, he has led high-throughput screening campaigns for therapeutic indications including diabetes, neuropathic pain and schizophrenia. Alan Mintz (GRS ’93) has started his second year as instructor of visual art at Bard High School / Early College Cleveland. David J. Kubacki (CWR ’96), president of Nativity Preparatory School of Wilmington, Del., was awarded an honorary doctor of humane letters degree by DeSales University in Center Valley, Penn. Anand Swaminathan (CWR ’97, MGT ’99), Accenture Digital’s managing director, was named to Fortune’s “40 Under 40” list of the most influential young people in business. John Paul Teague (CWR ‘04) made Super Lawyers Magazine’s Annual List of the Top Attorneys in San Diego. Teague is an associate attorney at Smaha Law Group. Adam Evans (CWR ’05, MGT ’09) has been named a Bingham Fellow and Professor of Management and Leadership at Transylvania University in Lexington, Ky.
Samantha Cataldo (GRS ‘12) has been named assistant curator at the Currier Museum of Art in Manchester, N.H. 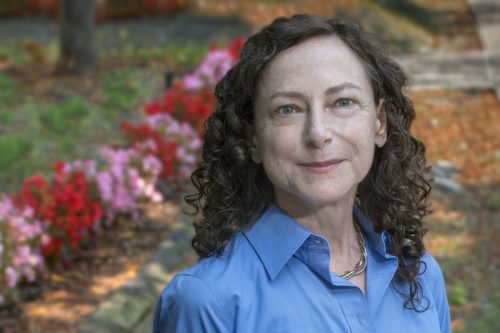 Her responsibilities will include acquiring post-World War II art and curating exhibitions, including the museum’s Contemporary Connections series. Stephen Michael Spencer (GRS ’14), a graduate of the Case Western Reserve/Cleveland Play House MFA Acting Program, played a leading role in the world premiere of Lynn Nottage’s play Sweat at this year’s Oregon Shakespeare Festival. The production will travel to Arena Stage in Washington, D.C., in January 2016. The notes in this section are compiled from news releases, other publications and messages from alumni like you. We want to hear about milestones in your life. Please send your updates, with your graduation year, to artsci@cwru.edu.